Trump push to give California farmers more water may shortchange science The Trump administration wants to allocate more of California's water to farmers. Internal government emails show concern that the change is being pushed too fast for adequate scientific review. Diversion facilities like this one help protect endangered fish in California. Environmentalists say such protections would be weakened under a Trump administration plan to send more water to the state's farmers. When then-candidate Donald Trump swung through California in 2016, he promised Central Valley farmers he would send more water their way. Allocating water is always a fraught issue in a state plagued by drought, and where water is pumped hundreds of miles to make possible the country's biggest agricultural economy. Now, President Trump is following through on his promise by speeding up a key decision about the state's water supply. Critics say that acceleration threatens the integrity of the science behind the decision, and cuts the public out of the process. At stake is irrigation for millions of acres of farmland, drinking water for two-thirds of Californians from Silicon Valley to San Diego, and the fate of endangered salmon and other fish. "It's a very aggressive schedule," says a former federal biologist familiar with the matter who did not want to be named for fear of retribution. "And I think it runs the risk of forcing them to make dangerous shortcuts in the scientific analysis that the decisions demand." That concern is shared by others. According to internal emails obtained under the Freedom of Information Act, federal scientists have raised two major concerns: that their agency lacks the staff to undertake the analysis, and that the Trump Administration is skewing the rules to boost the water supply for Central Valley farms. Some see the fingerprints of acting interior secretary David Bernhardt, who once helped lead the charge to increase water pumping and weaken environmental standards in the Delta. At the time he was a lawyer for the Fresno-based Westlands Water District, the largest agricultural water agency in the country. Bernhardt is already under scrutiny after a recent New York Times story found that, shortly after joining the Interior Department in 2017, he directly advocated on Westlands' behalf to get more water for farmers at the expense of endangered fish, even though federal rules precluded him from lobbying. The Campaign Legal Center, a non-profit ethics organization in Washington, D.C., filed a complaint demanding that the Interior Department's inspector general open an investigation into whether Bernhardt is using his public office to benefit his former client. Bernhardt now oversees two of the three agencies under orders from the White House to expedite the new rules shaping California's water future: the U.S. Fish and Wildlife Service and the U.S. Bureau of Reclamation. What we decide to do in the Delta really will determine if we drive our native species extinct and threaten thousands of fishing jobs. Just five years ago, Bernhardt stood before a panel of judges on the Ninth Circuit U.S. Court of Appeals. He was there arguing on behalf of Westlands Water District, and its 600,000 acres of farmland, that federal environmental rules protecting salmon should be thrown out. Now, as head of the agency that controls decisions affecting his former client, Bernhardt is leading the charge to replace those rules. Agricultural water districts have long disdained the current rules, officially called "biological opinions" and written in 2008 and 2009. 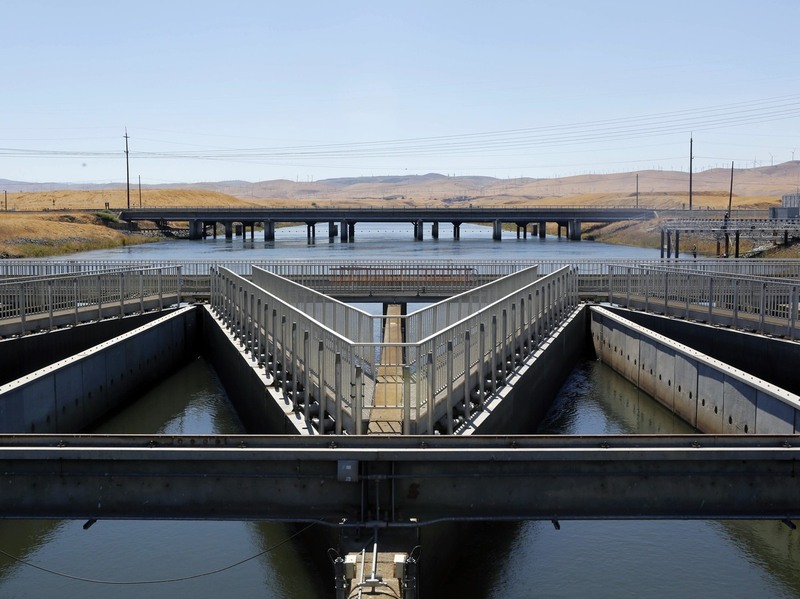 They require state and federal water pumps in the Sacramento-San Joaquin Delta, an estuary east of San Francisco Bay, to slow down when endangered salmon, smelt and other fish are nearby. That's because the pumps are so powerful, they reverse the natural flow of water in the estuary, killing the fish and altering their habitat. But limits on water pumping can diminish the water supply for Central Valley farmers, leaving them scrambling to fill the gap. This tension is often expressed in terms of "fish vs. farms." In October 2018, President Trump signed a memo ordering these pumping rules be rewritten more quickly than in the past. "I look at these incredible, beautiful fields and they're dry as a bone," Trump said just after signing the memo. "It's a disgrace." "That's definitely on our mind," says Erin Curtis, spokeswoman for the U.S. Bureau of Reclamation. "The president has outlined in his memo that we need to take a new look at how we're operating these projects in a way that we can maximize water deliveries." As a first step, the Bureau, which operates a sprawling network of dams and water pumps, released an 871-page proposal in February for how it would like the rules to operate. This new "biological assessment" calls for providing billions of gallons more water for agricultural and urban water districts, an increase of 10 to 15 percent depending on the year. That would leave less in the Delta for endangered fish. Defense Council in San Francisco. "What we decide to do in the Delta really will determine if we drive our native species extinct and threaten thousands of fishing jobs." I look at these incredible, beautiful fields and they're dry as a bone. According to federal law, two federal wildlife agencies, the National Oceanic and Atmospheric Administration and the U.S. Fish and Wildlife Service, must now review the Bureau of Reclamation's plan. If it doesn't do enough to protect threatened fish, the agencies have the obligation and legal authority to write rules that do. These biological rules will replace the current ones, although they could be challenged in court. Under President Trump's decree, federal biologists must write those opinions in 135 days, the minimal amount of time guaranteed under the Endangered Species Act. Given the complexity of the issues, the agencies have previously needed more time than that to complete their analysis, from 60 to 80 percent more time. They must look at how water flows across hundreds of miles through different rivers, dams and levees, and then forecast how it would affect the life cycle of half a dozen threatened species. These include endangered Chinook salmon and threatened steelhead and green sturgeon, as well as endangered killer whales in the Pacific Ocean, which depend on salmon for food. "How often does the Interior Secretary write a memo forcing that an opinion happens in 135 days?" says Cay Goude, former assistant field supervisor for the U.S. Fish and Wildlife Service office in Sacramento. "It's never happened to my knowledge." Goude worked on previous biological rules for the agency, on the Delta smelt, before retiring. "You don't want to rush anything and do a poor job," she says, "because it's very important to have the scientific facts accurate and appropriate." Even before Trump tightened the timeline one of the agencies, NOAA Fisheries, warned that it did not have the resources to do the analysis. In July 2018, Maria Rea, the assistant regional administrator in the California Central Valley Office of NOAA, described the agency's dilemma in an email to her internal staff. "We do not have resources to undertake this consultation," Rea wrote. She said the previous biological opinion in 2009 took 30 part-time staff and 10 full-time staff, and they needed 246 days to complete the process. Excerpt from an internal NOAA email obtained under the Freedom of Information Act. NOAA is working to reassign staff, currently on other projects, to at least achieve similar staffing levels, according to agency staff who were not authorized to speak publicly. The federal government shutdown in January slowed that process. According to the emails obtained by KQED, federal wildlife scientists also are concerned that the Bureau of Reclamation is pushing to give more water to agriculture at the expense of threatened species. In an email to fellow NOAA Fisheries staff last summer, Water Operations and Delta Consultations Branch Chief Garwin Yip outlined his misgivings about cases where there is scientific debate on what the fish need. "Absence of definitive science should not be the reason to propose actions more aggressive towards water supply," Yip wrote. Both Yip and Rea declined to comment about their emails. While the Bureau of Reclamation has updated its proposal since then, it's unclear whether those concerns have been addressed. Some environmental groups say the agency has cherry-picked the science in favor of boosting water for farmers. "It's not science, basically," says Jon Rosenfield, senior scientist with San Francisco Baykeeper, an environmental group in San Francisco. "It's an extraordinarily selective read and deliberate misinterpretation of the information that we have." Rosenfield points to several of the protections the Bureau of Reclamation is proposing to eliminate, such as rules that guarantee water flows through crucial parts of the estuary when fish are most at risk because they are closer to the pumps. The agency says "dynamic rules," which rely on new technology that monitors where the fish are in the Delta, can do a better job than fixed rules. "We feel that what we've proposed both helps protect listed species as well as provides more water supply flexibility," says Russ Callejo, assistant regional director for the Mid-Pacific Region of the Bureau of Reclamation in Sacramento. "We think it does both." Environmental groups are skeptical of that claim, saying the Bureau is proposing to dial back water pumping only after the fish are significantly harmed. The wildlife agencies will have to evaluate that during their biological reviews. This is where some see the influence of Bernhardt, who told The New York Times that he directed a senior official to weaken protections for fish, and divert water to farms, as part of a broader administration policy to help rural America. The internal emails also show the new environmental rules will receive less outside scientific review than before, which eliminates public involvement. Peer review, in which independent scientists assess other researchers' work, is a core practice of science, and previous biological rules have received that scrutiny. When the current rules were written in 2008, the draft biological opinion from NOAA Fisheries underwent an independent review by a panel of scientists. The process included a meeting where the public could attend and comment. This time, wildlife agencies say the Trump Administration's deadline won't allow for that. NOAA Fisheries, which is writing the environmental rules for salmon and other fish, plans to have some independent scientific review, according to agency staff. They say the draft biological rules will be sent out to individual scientists, but without public involvement or comment. The U.S. Fish and Wildlife Service, which is writing the environmental rules for delta smelt, says the agency is planning some form of peer review as well. "We intend to incorporate peer review into the development of our biological opinion," says Shane Hunt, spokesman for the federal agency's Bay-Delta Fish and Wildlife Office. "We are still ironing out the details." future water supply depends on how the rules are crafted. "It's always a red flag when you have the regulated entity, the entity that stands to lose something, having control over the regulation process," says Rosenfield. "We don't let the tobacco companies determine what level of smoking is safe." It was a shift made in 2016 when Congress passed, and President Obama signed, the WIIN Act, giving water contractors the power to "have routine and continuing opportunities to discuss and submit information" to federal agencies developing the biological opinions. The act, pushed by Senator Dianne Feinstein and Central Valley Republicans, was an effort at compromise after years of water battles in California. Before the Bureau of Reclamation even finished its recent proposed plan, water agencies had the chance to submit their take on endangered species protections. "We have adhered to the WIIN Act," says the Bureau's Callejo. "We have involved the public water agencies." Westlands Water District, which previously employed Bernhardt, did not respond to questions about its involvement. Water agencies will also receive drafts of the biological rules from wildlife agencies. Under the law, their comments must be "afforded due consideration" by wildlife biologists. If the comments aren't adopted, those biologists must explain why. There are no plans to release the drafts to the public.